Anime P is by the well known Indoctro Preferent out of Pepita S Elite by the GP stallion Emilion Preferent. Born in 2005 she stands near 17.2 hands. Anime is really special in her own way. She was First Premium and Champion in the KWPN TOP TEN yearling in North America when the jumpers and dressage were inspected together. But soon her disposition, way of going, kindness, and her to please capture the heart of my partner and she was pulled from my breeding program to become his own riding horse. Her trainer felt in love with her just like everyone who had the chance to be in her contact and repeatedly said on how he would love to have a barn full of Anime. Her breeding career took a side road for many years, but eventually work schedule and other responsibilities made it hard for him to be on a regular riding program she was bred twice. Now these foals made me realized how nice she produces: she give those rare qualities that make you want to keep your horse for life. She is an amateur dream but has the zest and talent to be appreciated by any professional. And this is what trainers of her foals are saying about them too. Indoctro is one of the most successful jumping sires in the world and was declared Preferent at the young age of 16. He is the sire of more than 66 licensed sons and in 2009 he was the sire of the Champion and Reserve Champion of the KWPN approval. His offspring continue to achieve successes at the highest level and a significant number of offspring have competed at Olympic Games. In 2016 in Rio de Janeiro Indoctro was represented by his sons Imothep and Amarillo. At previous Olympics were: Vedor, Casadora, VDL Orestus, Don Porfirio and Nike. In the 2008 Olympics there were 3 of his offspring selected. 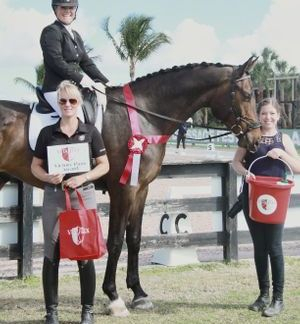 All over the world Indoctro has produced winners at Grand Prix and World Cup level. Casadora, Youp, Tampa, Nassau, Black Ice, Orame, Picolien, Zeldenrust and Robin to name a few. His most famous offspring include Nike, VDL Masserati, Nadia and Nobel. Indoctro was named the USEF jumping sire of the year in the USA. Indoctro not only passes his jumping genes but also a good conformation which is demonstrated in many champions at the several mares and foals show and Anime is a good example. 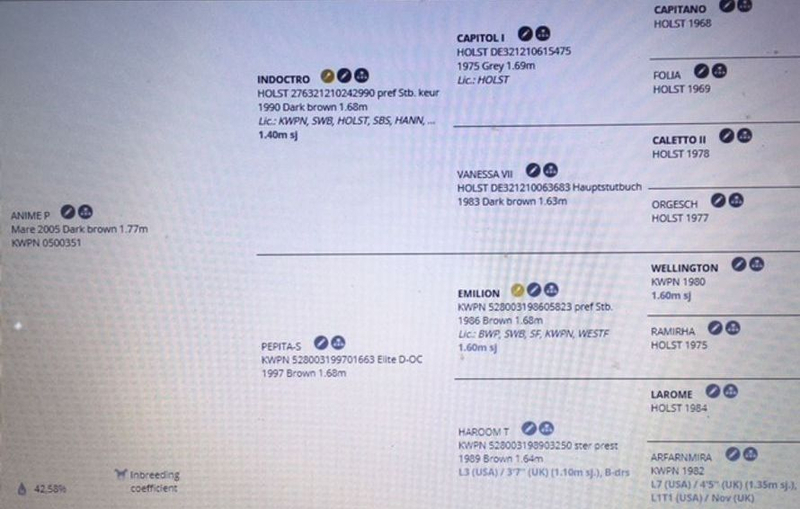 Indoctro is another of those hugely successful Capitol / Caletto II crosses. His dam Vanessa VII also produced two full brothers, C-Indoctro II and the Olympic showjumper, National Guard ridden by Fahad Al Geaid. Dam Pepita S is by the famous KEUR stallion . Emilion had a great carreer as a Grand Prix show jumper where he won the World Cup at Mill STreet, 4th at Valkenswaard, 2nd in Donaueschingen, 5th in London and 6th in the World Cup at Aarhus. With the German Team, he was 4th in Dublin and Rotterdam and 2nd in Bremen. His ‘Keur’ IBOP dam is a daughter of the full sister of the Holstein top sire ‘Lord’. Full l brother of Pepita is the Approved KWPN Grand Prix Jumper stallion Sarantos. Emilion belongs to the world’s best jumphorse producers. His offspring are performing worldwide in Grand Prix and World Cup classes. One of the most well known offspring at the moment is Seldana, who won with her new rider Abdullah Al Sharbatly the Silver Medal at the World Championships in Kentucky. She also was the winner of the Silver Medal at the European Championships in 2009 with the Italian Team. Also very famous was Emilion’s son Glasgow, who competed for years at the highest International level and won several World Cups and Grand Prix, he won the CN Reliability Grand Prix of Canada three times and was crowned the ‘USA Horse of the Year’. VDL Groep Tomboy with E. van der Vleuten won several Grand Prix and World Cup Qualifiers. Other successful Grand Prix jumpers are the Dutch Champion VDL Emmerton with J. Vrieling, Ukinda with H. Simon, Vince wit J. Torano, VDL Ugano with K. Rikkert, Salermo with G.M. 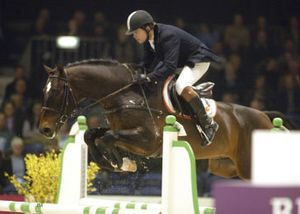 Panini, Valdato with J. Kayser and BMC Uno ridden by C. Regter. More successful international showjumpers are: Sering, VDL Sarantos, Sefana, VDL Empire, Made in Margot, Exclusive, Pornita, Tao Tao, Enorm, Inspiration, Fritzy, Jashar, VDL Lotus Exel, Jemilion, Karina, Utopia van het Hoogveld, VDL Nantes, Miss Montana, Lady’s Foal, VDL Edminton e.g. The siblings of Anime are still young but are consistent in proving the quality of their bloodline being in the top ten or top five of the KWPN every year. Most of them First Premium, her full brother was North American Champion Jumper Gelding, Reserve Champion iron Spring Cup for 3 year old jumper and number 3 on the TOP-FiVES liest jumer IBOP. 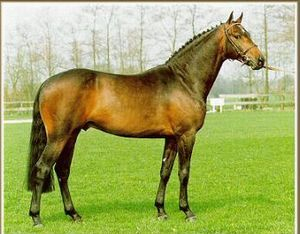 Pepita’s dam, Haroom T, is a Ster KWPN mare by the Holsteiner stallion Larome. Prior to starting her breeding career Haroom competed successfully in both dressage and jumping. JAYLABA BLOOM her second and last offspring stands 16.3 as a 4 years old. Born in 2014 by Capone I another Contender son, this filly is all jumper with long forearm and very short cannon bone. This is seeks in any performance horse because it which contributes to speed, stamina, soundness, and jumping ability. And we can see how effortless jumping is for her. She is another one with good brain and athleticism to spare. She is showing great aptitude and willingness to please just as her dam. This make her trainer 's life easy . She has potential for the big ring. Good for the amateur and appreciated by the professional.